This is one of my favorite pictures ever. 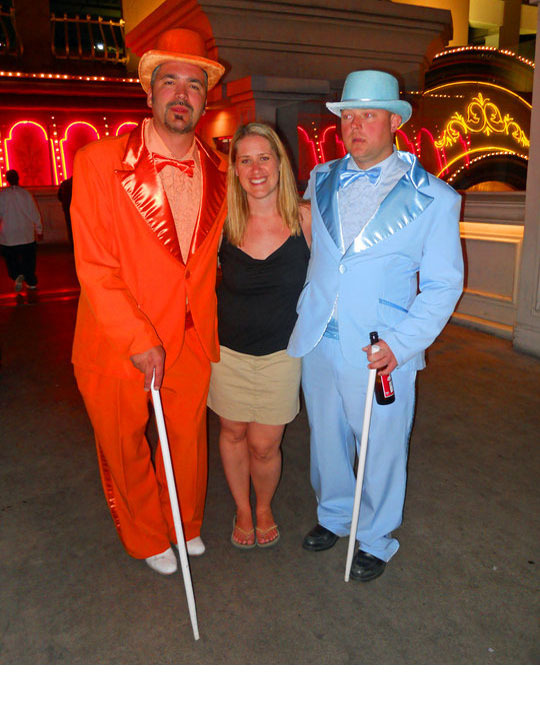 I was on a trip to Vegas with my good friends Kellie and Sarah a little over 2 years ago when we happened upon these two fellas. They weren’t overly thrilled about taking a picture with me – something tells me I was not the first to request one, but you can’t dress up like Harry Dunne and Lloyd Christmas and not expect people to get excited about it. Dumb And Dumber is definitely in my top 10 comedies, if not top 10 movies of all time. I can watch it over and over and it still makes me laugh. There are countless lines from the movie that you can quote throughout your day. One of my previous co-workers and I would always use “So you’re telling me there’s a chance.” whenever someone would mention how unlikely it was that something was going to happen. This entry was posted in Flashback Friday and tagged Dumb And Dumber, Harry Dunne, Lloyd Christmas, Vegas by Amy. Bookmark the permalink. Good Times Amo! Remember right after this you guys had to shield me from seeing some chick puking! What?! I don’t remember that at all! I never thought of that…Vegas is a dangerous place for you and your puke phobia. It’s a definite must go, but it isn’t one of my most favorite places. I have been 3 or 4 times and always had fun, but I leave feeling a little dirty.